Nutella Napoleon Recipe - Let the Baking Begin! 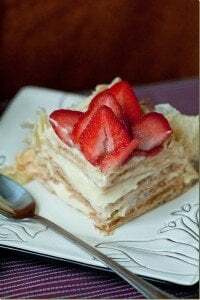 It’s kind of hard to top a good old fashioned Napoleon cake. You know, gazillion layers of flaky pastry layered with sweet custard and all that jazz. But as hard as it might be to believe, I think this recipe is even better than the Best Napoleon Ever. After all, Ferrero Rocher candies and Nutella are involved and when has a Ferrero Rocher or Nutella ever ruined anything? I know, never. Several days ago, I posted a picture of someone making the Mikado cake following my recipe. Remembering the flavor of that cake made my head spin. I needed a slice a.s.a.p, in order to continue being a functional member of society. 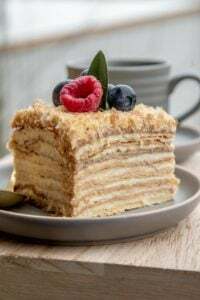 That cake is made of homemade sour cream based quick puff pastry layers. But, I had no intention of making those from scratch this time. I had some sheets of puff pastry in the freezer and I planned to use them instead. For the cream, the Mikado cake uses chocolate custard based buttercream and even that was a more elaborate process than I was wanting to go through for this cake. Shortcuts, shortcuts, shortcuts people! As I was making myself some tea that morning, I opened the cupboard and saw a jar of Nutella sitting on a shelf and that’s when it hit me. I am going to make a Napoleon with Nutella Cream which will taste like the Ferrero Rocher Candy! 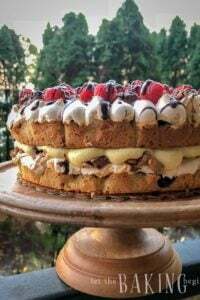 With pre-made sheets of puff pastry and an easy alternative to the chocolate custard based buttercream I had the cake ready and assembled in about 45 minutes and that’s only because the cake layers take about 15 minutes to bake, otherwise, I could have had this cake in minutes. Even though it looks fancy with decorative piping on top and all (the piping is very optional) there’s really nothing fancy or hard about this cake. I like easy and delicious and you will too! Preheat oven to 425F.Place the thawed puff pastry sheet on a well-floured surface and roll it out to about the size of your jelly roll pan. Transfer the rolled out sheet to an upside-down jelly roll baking pan and cover with one more jelly roll sheet (leaving the top baking sheet the right side up) just like the picture below. Bake for about 10 minutes and rotate the baking sheets 180 degrees, then bake another 2-5 minutes until the puff pastry sheet is well-baked through and golden. Watch it very closely as it goes from golden to burnt in a matter of seconds. Transfer the baked sheet to a cooling rack and allow to cool. Now bake rest of the puff pastry sheets. Once the sheets are cooled, cut them in half. Putting a baking sheet on the halfway mark and going along the edge is the easiest way to do that. Trim the other end of each half to make it even. Cut and trim the rest of the cake layers. You should have 4 halves. Set aside and make the Nutella Cream. In a bowl of a mixer whip together cream cheese, sugar, vanilla extract and the cocoa powder until creamy and fluffy. Scrape down the sides of the bowl several times throughout the process. Add the heavy cream and whip again for until well combined and increased in volume, but not yet stiff. Add Nutella and whip again until no streaks of Nutella are seen. Take away about 1 – 1/2 cups of frosting and refrigerate until ready to decorate tomorrow. Put a dab of cream on the serving platter/carton and spread a round a bit. This will keep the cake from sliding. Put the first layer of baked puff pastry and press to adhere. Add 1/6th of the frosting and spread around into an even layer. Continue layering puff pastry layers and cream until all are gone, frosting the last one on the top as well. After refrigerating the cake overnight, trim the sides all around with a sharp knife. Then along the wider side, cut it into 5 equal strips giving you a total of 15 pieces. An electronic carving knife or a sharp thin knife dipped in hot water (to make the knife hot) and then wiped clean works the best. Fit one sandwich bag into another, then fit the two bags with a star piping tip (two bags keep the corner from being stretched too much and letting the piping tip slide out). Now drape the bags over a glass and fill with frosting. Close the ziplock bags and pipe the cream in repetitive S shapes or any other design you would like on top of each piece of cake. Top with whole or halved Ferrero Rocher candies. (optional). And you’re all done my friends. Now invite some friends, brew a cup of coffee and enjoy! Kartoshka Rum Balls – Delicious sweet cookie balls. Cranberry Bliss Bars Recipe – A great blondie base with chocolate chunks and dried cranberries. Hazelnut & Plum Butter Sable Cookies – Yummy cookies with plum butter and hazelnut. 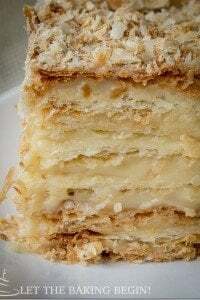 Nutella Napoleon - flaky layers of puff pastry filled with nutty Nutella cream - a decadent dessert that's easy to make. Preheat oven to 425F.Place the thawed puff pastry sheet on a well floured surface and roll it out to about the size of your jelly roll pan. Transfer the rolled out sheet to an upside down jelly roll baking pan and cover with one more jelly roll sheet (leaving the top baking sheet the right side up) just like the picture below. Bake for about 10 minutes and rotate the baking sheets 180 degrees, then bake another 2-5 minutes until the puff pastry sheet is well baked through and golden. Watch it very closely as it goes from golden to burnt in a matter of seconds. Once the sheets are cooled, cut them in half. Putting a baking sheet on the halfway mark and going along the edge is the easiest way to do that. Trim the other end of each half to make it even. Cut and trim the rest of the cake layers. You should have 4 halves. Set aside and make the Nutella Cream. Thank you for the recipe. It’s delicious. I have made 2 of your recipes. The King of Napoleon and the Natella Napoleon. I was able to print the King of Napoleon recipe but could not find a print for the Nutella. Therefore, I typed all the instructions and printed a small picture and taped it on top of Nutella recipe for my file. 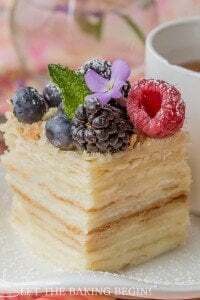 5 Best Napoleon Cake Recipes - Let the Baking Begin! Do you have a printable recipe for this? It looks so yummy! Does it stay crispy overnight? Or should I serve same day if I want it to be on the crispy side? Could the cream cheese be substituted for something else? This cream kind of needs the cream cheese to thicken the cream. 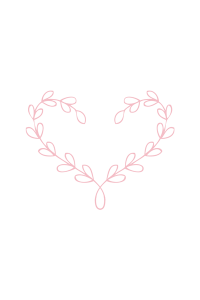 I am not sure what can be used instead to perform the same function…. I’m confused. It says to use two puff pastry sheets then it says to cut each one in half which would give you four halves, but the instructions say you will have 6 halves. Am I misunderstanding the instructions? Because it says up there 2 sheets of puff pastry. Two sheets cut in half would be four not six. I want to try this recipe because it looks fantastic. I am missing the link or is there no print this recipe option for this cake? Oh I love what you’ve done and especially the fact that you took shortcuts, pure brilliance. This Napoleon looks gorgeous, Marina!